Traci Dawn (Spangler) Fagan, age 48 of Kodak, passed away Monday, November 12, 2018 at Parkwest Medical Center. Born to parents, David Thompson and Elizabeth Dian (Taylor) Spangler in Knoxville. She was a 1988 graduate of Karns High School and attended Pellissippi and Walter State Community Colleges. 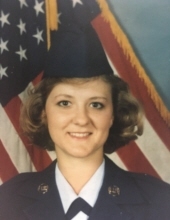 She served her country in the US Air Force and returned home to continue working in the insurance industry. During her tenure she worked with State Farm and later operated her own Allstate agency serving Knox and Sevier Counties. Traci adored her girls and enjoyed all of their activities from basketball to cheerleading. She was a hard working lady looking out for her family who will miss her terribly. She is preceded in death by her father, David. Survivors include her daughters, Taylor, Matti and Marci, all of the home; mother, Dian Spangler; grandmother, Helen Spangler; sister, Tammy Marcum and brother, Davy Spangler ; nieces, Ceaira and Callie Ann; great nieces and nephew, numerous cousins and friends. Services honoring and remembering Traci will be held 7:00 PM Thursday, Nov. 15th at Click Middlebrook Chapel with Rev. Josh Spangler officiating. A private interment will be take place in the E. TN State Veterans Cemetery. The family will receive friends 5:00 – 7:00 PM Thursday prior to the service at Click Middlebrook Chapel, 9020 Middlebrook Pike, Knoxville. To send flowers or a remembrance gift to the family of Traci Dawn (Spangler) Fagan, please visit our Tribute Store. "Email Address" would like to share the life celebration of Traci Dawn (Spangler) Fagan. Click on the "link" to go to share a favorite memory or leave a condolence message for the family.